We’d love your help. Let us know what’s wrong with this preview of Carrying the Fire by Michael Collins. To ask other readers questions about Carrying the Fire, please sign up. Does anybody has this book in pdf or ebook format? I can't buy it from Amazon and there is no other digital copies of it. Recommends it for: Every school library in Britain ought to possess a copy of this book. Here is the book to convince every fourteen year old that a sound practical knowledge of the language of maths and engineering is both enormously exciting and career liberating. How very different our world would be today if we employed many more research engineers (in which I include test pilots turned astronauts) than self-obsessed bankers! This is a book to read and re-read. This is a book I cherish. This is not merely a book on how Man realised his dream of landing on our Moon. Instead Superb. This is not merely a book on how Man realised his dream of landing on our Moon. Instead it is a description of how an awesome number of skilled people came and successfully worked together to realise an expensive political and technological dream. I learnt something too about Project Mercury, the predecessor of Gemini and Apollo; and by happy chance a few days ago picked up a copy of “Into Orbit” (written by the ‘Mercury Seven” astronauts) in a second-hand bookshop. Relatively early on Collins hilariously describes the wondrous training he received in the geology of (Earth) rocks, and in personal survival techniques. I was entirely unable to read this section without sniggers of suppressed, and hoots of open, laughter. Hilarity eventually subsided, whereupon I discovered space to soberly consider the very real difficulties of actually defining training for the unknown and unexpected. I was deeply moved by Collins sensitive, considerate and factually concise discussion of the horrendous spacecraft fire in January 1967 aboard Apollo 1 on the launch-pad at Cape Kennedy; which killed Gus Grissom, Ed White, and Roger Chaffee. Collins was deeply affected by the realisation that everyone had overlooked such an obvious risk (combustible oxygen inside the spacecraft at 16psi: slightly above atmospheric pressure), and had thus not been evaluated. As throughout his book, Collins is realistic and mature in recognising the human tendency to react by laying blame, before maturity and sense muscle in to define and solve the problem. However, achingly and tellingly, he succinctly speaks of ‘the dismal months of early 1967’, proving that few words carry more meaning than many. In chapter 11 Collins describes how essential training on a simulator was to the success of space flight. It is vitally important nowadays to remember that this was 1960s ‘bathtub’ technology: punched cards, a budget of millions of dollars, and hundreds of maintenance technicians working in three shifts. He dryly remarks that at times it seemed easier to fly the actual spaceship! Later on Collins, Armstrong, and Aldrin are as equally amazed as each other by the perfection in accuracy achieved by the operational system in placing them in a near-circular lunar orbit. Such ‘childish’ and simple joy is infectious. Collins could have chosen to keep a tight technical focus in his description of the flight of Apollo 11 mission. He intelligently does not do so; instead opting to draw the attention of his reader to what this extraordinary mission meant to other earth-bound members of the human population. Any list of the more off-beat examples must surely include Houston’s reading of the daily news to the astronauts. On 20th July 1969 this included an ‘instruction’ to look out for a beautiful Chinese girl called Chang-O who four thousand years previously had been banished, accompanied by a rabbit, to the Moon. Her crime had been to steal the secret of immortality from her husband. The rabbit was claimed to be easy to spot because he always stood upright on his hind legs, under the shade of a cinnamon tree! Collins masterly desists from directly pouring cold water on such an absurdity; he instead applies the art of diplomatic prioritisation: deciding that the simultaneous purge of a fuel cell, setting up a camera & brackets, and monitoring an auto manoeuvre really do require his full attention above and over that of spotting a rabbit! Shades of the 1950 film “Harvey”, starring James Stewart, perhaps? Whether Armstrong and Aldrin kept a weather-eye open for the Moon rabbit is (rightly) not recorded. “I feel this powerfully – not as fear or loneliness – but as awareness, anticipation, satisfaction, confidence, almost exultation. I like the feeling.” [pg. 402]. If I had read those words before reading this book I should not have understood what he meant. But now I think I may do. Michael Collins is multilingual. He communicates in written English supremely well. How many men and women ‘of letters’ possess a comparable ability to express themselves in the fields and languages of science and engineering? It’s a rare combination. Collins is also a remarkably modest man, blessed with both a firm sense of responsibility and the most wonderful dry sense of humour. He is a true team player, but, importantly, one whose maturity, skills and talents fully justify his personal sense of worth and purpose. This is probably the best non-fictional book I've ever read. On nearly five hundred elated, honest, vivid and detail-filled pages Michael Collins wraps up his brilliant career as a USAF test pilot, engineer and NASA astronaut on both the Gemini 10 and Apollo 11 missions. Being very humble, Collins confesses that he thinks he never possessed extreme talent or expertise in any of the necessary fields of becoming an astronaut (I'm sure he did though), and that his career was rather an excellent thr This is probably the best non-fictional book I've ever read. On nearly five hundred elated, honest, vivid and detail-filled pages Michael Collins wraps up his brilliant career as a USAF test pilot, engineer and NASA astronaut on both the Gemini 10 and Apollo 11 missions. Being very humble, Collins confesses that he thinks he never possessed extreme talent or expertise in any of the necessary fields of becoming an astronaut (I'm sure he did though), and that his career was rather an excellent throw of the dice, having a lot of luck throughout two decades, even when unfortunate occasions came his way (like spinal surgery just before his designated first flight with Apollo 9, shifting him to Apollo 11). The greatest parts are when the reader is taken aboard his two space flights, on Gemini 10 in 1966 (including a difficult EVA and orbital docking), and eventually on humanity's biggest stunt in history, the 1969 Apollo 11 mission to the Moon (where Collins piloted the command/service module (Columbia), solo-orbiting while Aldrin and Armstrong touched down on the surface with Eagle). Collins shows his excellent command of bringing down those events to paper - and by including both technical details (like orbital mechanics) and the depth of emotions he was going through, thus making the book a fascinating and precious read. The author also sheds light on the more philosophical side of humanity's space exploration, including many pages of his own thoughts about the world in 1974, back when he wrote the book. Many of those thoughts and gentle warnings about fossil fuels and human waste have become a reality, and the book is as relevant today as it has ever been. Collins notes early on in this book that he chose to eschew the services of a ghostwriter, apologizing that the prose will not be as polished as a result. It was a wise choice. Collins' voice is friendly and straightforward, eminently likeable. He has little interest in delving into deep psychological analysis or talking much at all about his personal life, choosing instead to focus on his path, and NASA's, to the moon. Self-deprecating humor and a profound appreciation for the contributions of t Collins notes early on in this book that he chose to eschew the services of a ghostwriter, apologizing that the prose will not be as polished as a result. It was a wise choice. Collins' voice is friendly and straightforward, eminently likeable. He has little interest in delving into deep psychological analysis or talking much at all about his personal life, choosing instead to focus on his path, and NASA's, to the moon. Self-deprecating humor and a profound appreciation for the contributions of the people surrounding him keeps the tone light and prevents any trace of boasting as he recounts a remarkable career. The details really are fascinating. I knew a lot of the history, having been an enormous space buff as a child, but there's a difference in hearing it from a personal perspective. The Apollo 1 fire, for example, skips any of the gruesome descriptions that other works have lingered on--these were people he knew well and Collins has no interest in describing their deaths in detail. His perspective is that of the only person available to drive out and tell one of the dead men's wives before she can hear it from the media. It brings a different perspective. Other details are just amusing. I'd known that the astronauts were quarantined upon their return. I had not realized they were essentially loaded up in a shipping container with a big window and shipped, flown, and finally driven home by flatbed truck like a cargo of zoo animals. It was a hilarious image. I am a space buff and have read many good accounts of the space program, including Andrew Chaikin’s amazing “A Man on the Moon,” which should be required reading for everyone interested in these genera. 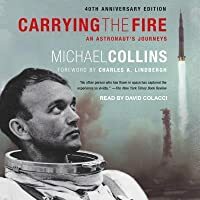 As for books written by astronauts, “Carrying the Fire: An Astronaut's Journeys” by Michael Collins is probably the best I have read along with Jim Lovell’s “Lost Moon,” aka “Apollo 13.” An important point to make right off the bat is that Collins had no co-author on this project as many do. He did it all himself, and let me tell you, he can write. Michael Collins, for those of you who don’t know, was the third astronaut on Apollo 11, the one who stayed up and flew the command module while Neil and Buzz got all the press making the first moon landing. Some may think that the Command Module Pilot got the short end of the stick because he didn’t actually get to land on the moon, but Collins doesn’t see it that way. “I know that I would be a liar or a fool if I said that I have the best of the three Apollo 11 seats, but I can say with truth and equanimity that I am perfectly satisfied with the one I have. This venture has been structured for three men, and I consider my third to be as necessary as either of the other two.” He probably could have stuck around after Apollo 11 and walked on the moon as Commander on Apollo 17, but his experiences on Apollo 11 and Gemini 10 were enough, and he was content to walk away. I particularly enjoyed the behind the scenes look at things you don’t usually see in the space program, such as the frustrations of training, quarantine before and after the mission, honest personal and humanizing views of other astronauts, and dealing with the often overwhelming worldwide public relations required by the job. Collins makes everything interesting, from his early career in the Air Force, through the early astronaut selection process (from which he was rejected), to his work in the development of the Gemini and Apollo EVA suits (and the little old ladies tasked to hand-glue the pieces together in the David Clark Company factory in Worcester, Massachusetts). There is an especially interesting section where Collins and Dave Scott are sent to the Paris Air Show in May, 1967. There, at the height of the space race and cold war with the USSR, they meet and find much in common with “the competition,” Soviet cosmonauts Pavel Belyaev and Konstantin Feoktistov. “In Belyaev we found a kindred spirit. I liked him, and I would have flown with him.” These are honest and courageous words for a man of Collins’ stature to put into print in 1974. Open encounters like these may have helped lay the foundation for the joint U.S./Russia International Space Station missions we have today. What really sets this book apart from other “astronaut books” are Collins’ intelligent, candid, and self-depreciating observations about astronaut life (no chest beating here), and the breathless minute-by-minute accounts of both his Gemini 10 and Apollo 11 missions. I wasn’t too familiar with Gemini 10, and was fascinated by his interactions with John Young, their two rendezvous with two different Agena Target Vehicles, and Collins’ two EVAs. For the EVAs, he has to maneuver using a nitrogen gun and practices while standing on a disk in a space the size of a boxing ring set up like an air hockey table. For his first EVA he stands up in the Gemini cockpit with the doors open and feels like a “Roman god riding the skies in his chariot.” His second EVA is successful, but Collins makes no bones about how dicey it actually is. He applies to NASA for travel reimbursement after the flight and receives a grand total of $24. Collins speaks frankly about the difficulty some astronauts have, upon their return, of preventing the rest of their lives from being an anticlimax. There is also the temptation of easy money. “There is money hanging around, but it is tainted PR money, trading great piles of greenbacks for tiny bits of soul, in an undetermined but unsatisfactory ratio. For example, I have been offered $50,000 to do beer commercials, and I love beer, but somehow it seems a grubby thing to do…. So I remain flat broke, and I rationalize it by saying that it is a good thing, that it forces me to focus on the future, and that it keeps me lean and hungry in my outlook.” This, in a world today where many young people don’t even know what selling out means. Michael Collins is a man of integrity, insight, and humility often lacking in today’s public figures. “Carrying the Fire” is excellent. It is well written, moving, engaging, funny, and very personal. If you read just one book by an astronaut, make it this one. Very highly recommended. While this was written several decades ago it feels timeless and important. Not many people could say they’ve been to space, or the moon, or orbited the moon by themselves- at times the only human in the universe to be on the dark side of the moon- while their companions were walking on its gray sands. I could say I wanted more- I don’t know what more, maybe more introspection, or poetry- but really for what this is I’m wholly satisfied. I like the stark honesty and detail Collins uses to descri While this was written several decades ago it feels timeless and important. Not many people could say they’ve been to space, or the moon, or orbited the moon by themselves- at times the only human in the universe to be on the dark side of the moon- while their companions were walking on its gray sands. I could say I wanted more- I don’t know what more, maybe more introspection, or poetry- but really for what this is I’m wholly satisfied. I like the stark honesty and detail Collins uses to describe NASA, other astronauts he worked with, even his own somewhat pompous habits of thought that he pokes at with subtle humor. I can’t get enough of astronaut memoirs right now and I think part of that is due to them being both extremely exciting- having an experience and a perspective few could ever imagine- and being written clearly by the actual astronauts and not some editor or ghost writer as is the case for many celebrities and politicians making books these days. Collins was a military man, an astronaut, and yet also a well-spoken scholar as is apparent with his words when he describes the feeling of being content never to return to space. I feel like he probably read some Hemingway to polish up before typing it out. And he’s still alive today- a fascinating portrait of a space man. 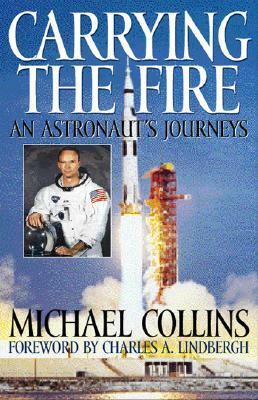 Carrying the Fire is the memoir of Michael Collins, who was command module pilot on Apollo 11, the first human lunar landing mission. More than forty years after its first publication, it is still the gold standard of Apollo astronaut bios. Collins has a real feel for writing, compared with his colleagues, most of whom have written very dryly. (It is also worth noting that Collins is one of the very few astronauts--maybe the only one--who wrote without the need for a collaborator.) He was known Carrying the Fire is the memoir of Michael Collins, who was command module pilot on Apollo 11, the first human lunar landing mission. More than forty years after its first publication, it is still the gold standard of Apollo astronaut bios. Collins has a real feel for writing, compared with his colleagues, most of whom have written very dryly. (It is also worth noting that Collins is one of the very few astronauts--maybe the only one--who wrote without the need for a collaborator.) He was known in the astronaut corps for his casual professionalism. Collins is frequently witty, funny, self-deprecating, and he's unafraid to level withering criticisms at some of the madness of being an astronaut. His description of an astronaut's worst nightmare--going around the country on speaking gigs to promote the space program, which he calls being 'in the barrel'--is especially memorable. Collins is the astronaut who wrote that he and his test pilot brethren were ill-suited to be the public faces needed to communicate the thrills and beauty of being in space--he thought that job would be better off in the hands of 'priests, poets and philosophers.' But of course, Collins puts it so much more eloquently than I can muster. He also shares, with his characteristic candor but not a hint of melancholy, his unprecedented isolation while his Apollo 11 crewmates journeyed to the lunar surface. As he circled the moon alone in the command module Columbia, Collins was further from human contact than any person had ever been in history. He also understood that if a critical emergency stranded his crewmates on the moon, it would have been his duty to leave them and come home alone--a monumental task he says he was prepared to do. Michael Collins never set out to be an Astronaut, or make history, but he did and he did it with determination, humor and a Rocket named Apollo XI. This book was written when everything we know about Space today, wasn't known then. There was no ISS, there was no high tech laptops and colorful video cameras. Mobile phones today have more advancements than Space did in those times. Yet they managed to send Astronauts to the moon, more than once. Everything back then w An educational, inspiring read. This book was written when everything we know about Space today, wasn't known then. There was no ISS, there was no high tech laptops and colorful video cameras. Mobile phones today have more advancements than Space did in those times. Yet they managed to send Astronauts to the moon, more than once. Everything back then was new, undiscovered, and spending more than weeks in Space was unheard of, unlike today. When I picked up this book -and despite the great reviews written about it- I was still hesitant to read it, not because it was another Astronaut autobiography but because it may be filled with terminology I didn't understand, and it was, however, Mike wrote in a way that made these big, unfamiliar words (along with phrases) easy to understand, he explained everything with precise attention to detail, even words you think wouldn't need explaining. It's not rare to find an honest autobiography but it's rare to find an honest autobiography that wasn't filled with malice or spite. Everyone is curious as to what goes on, and Mike gave us that in a humorous, tactful way. I found him to be humble. Michael Collins has a fantastic story to tell. He is a fine writer - first class, actually - and a wise and insightful human being. Enough said. There is a reason that of every astronaut memoir or biography...this remains the one that they are all measured against. A true classic in astronaut literature and the Gemini and Apollo eras. Read this instead of sensationalized fictionalized fluff like "The Right Stuff". Highly recommended. Simply magnificent! As I've spent the last few days tearing through this engrossing book, I've been mindful of how I might be able to review it once I'd reached its end. Now that I have done so I find that I don't really know quite how to express what it is about Michael Collins' writing that moved me so much - except that I know this is most definitely one of the best memoirs I've ever read. It is truly a one-off, as the events it describes are so unique (most obviously the historic Apollo 11 m Simply magnificent! As I've spent the last few days tearing through this engrossing book, I've been mindful of how I might be able to review it once I'd reached its end. Now that I have done so I find that I don't really know quite how to express what it is about Michael Collins' writing that moved me so much - except that I know this is most definitely one of the best memoirs I've ever read. It is truly a one-off, as the events it describes are so unique (most obviously the historic Apollo 11 mission) that they could only have been written by one of the members of 1960s NASA space program who was actually 'there'. The early chapters retell his experiences as a USAF test pilot while in the background NASA's manned space program is underway. After some early setbacks he is eventually accepted into the astronaut staff at NASA in Houston, and begins the arduous training for the Gemini program. Amidst tales of geological field trips and survival training in inhospitable desert or jungle environments (in the event of any future re-entry going awry), and endless sickness inducing zero gravity dives, he gives a great sense to the day to day existence of an astronaut-in-waiting. As enjoyable as these pages are, the reader knows - as does the author of course - that it is all building up to the momentous day when he will finally sit at the 'tip of the pencil on the launch-pad' at Cape Kennedy on his way into space. The Gemini 10 mission he flies along with John Young is covered in every breathtaking detail, none more so than Collins' 2 EVAs (Extra Vehicular Activity - spacewalks to you and I). In the first, as he was taking star readings with his sextant whilst standing up in the hatch - head and shoulders out 'there' in space - he writes that he felt at that moment "like a Roman god riding the skies in his chariot". The 2nd EVA, where he has to leave the Gemini altogether and cross the void to reach the adjacent Agena craft (sent up previously specifically for this planned rendezvous), for the purposes of removing and replacing an experiment installed on its outside, is altogether more terrifying. He finds himself grappling with zero gravity while attempting to 'climb' aboard the rear end of a craft patently not designed for such an activity (there were no foot or handholds for his convenience) in bulky spacesuit complete with cumbersome gloves and yards of entangling umbilical line... There is no 'up' and there is no 'down' - talk about vertigo! All this while simultaneously reminding the Gemini pilot Young not to use whichever thruster may happen to be nearest to burning through either said umbilical lines or indeed Collins himself! It's edge of your seat stuff. The final third of this terrific book covers the famous Apollo 11 mission to the moon itself. The quirks of fate that led him to this moment are not lost on Collins as he writes of the medical problem which was discovered while he was due to be assigned to the Apollo 8 mission. His flight status of 'grounded' for several months inadvertently leads to his later inclusion on Apollo 11. I won't retell all that happens, but the moments when he is truly as alone as any human being has ever been - Charles Lindbergh's later congratulatory letter tells of relating to his experience more so than Armstrong's or Aldrin's - in lunar orbit while the landing module 'Eagle' is away on the Moon's surface are some truly gripping passages of tension. That said, the whole exciting tale is really page turning stuff. The final chapters contain Collins' thoughts on space travel in general (written in 1973) and where it might be headed. As well as his thoughts on humanity's attitudes to our 'blue and white planet', he poignantly expresses with one word above all how he sees Planet Earth now that he has seen the 'world in a window' - fragile. What to say other than that I'm overwhelmed with things described in this majestic book. To read about spacewalk and orbiting the moon firsthand left me with the feeling of extreme humility and at the same time left me inspired to continue my own explorations (whatever small they may seem) and to always be curious. Gemini 10 and Apollo 11 descriptions are like poetry. Knowing that Michael Collins wrote it himself is astonishing. The last chapter with the author's thoughts about the world and his li What to say other than that I'm overwhelmed with things described in this majestic book. The last chapter with the author's thoughts about the world and his life after the moon landing are pure gold. Only thing I missed is how did the author's NASA assignment impact his family in those 6 years. I would have liked to read more about it. Truly an inspirational read. Collins' personality comes through perfectly: human, humble, excited by his luck, a keen observer of technical and human features and frailties, not trying to sound other than he is. This is a book about the space programme taken broadly, perhaps best exemplified by the fact that it takes until page 364 (of 478) to get to the take-off of Apollo 11. Collins talks about his history in joining the programme (at the second attempt), his experiences in the Gemini programme Truly an inspirational read. Collins' personality comes through perfectly: human, humble, excited by his luck, a keen observer of technical and human features and frailties, not trying to sound other than he is. This is a book about the space programme taken broadly, perhaps best exemplified by the fact that it takes until page 364 (of 478) to get to the take-off of Apollo 11. Collins talks about his history in joining the programme (at the second attempt), his experiences in the Gemini programme before Apollo, the tensions and differences that went into the design, testing, and flight of the vehicles themselves. He deals frankly with his flight experiences and his lack of jealousy at not actually making a moon landing himself: he probably could have done on a later mission had he not consciously decided beforehand to walk away from spaceflight after Apollo 11. He is fascinating on the subject of his own isolation in the orbiting command module, which he found far from lonely and which led to an amazing exchange with Charles Lindbergh, himself no stranger to solo flight. Of the three crewmen for Apollo 11, which is likely to have the most interesting story? The mission commander, first man to set foot on the moon and subsequently a household name? The co-pilot of the lunar module, cheated of glory by being only the second man to walk on the moon? Or the command module pilot, alone in orbit around the moon while the landing progressed, never setting foot on its surface? Charles Lindbergh believes the latter, and I am inclined to agree with him. Carrying the Fire is Of the three crewmen for Apollo 11, which is likely to have the most interesting story? The mission commander, first man to set foot on the moon and subsequently a household name? The co-pilot of the lunar module, cheated of glory by being only the second man to walk on the moon? Or the command module pilot, alone in orbit around the moon while the landing progressed, never setting foot on its surface? Carrying the Fire is the story of Michael Collins, the Apollo 11 command module pilot, and his career as a test pilot and astronaut. The book does not suffer the fate of early drudgery that befalls most biography: Collins knows that his childhood and family life are of little interest to his readers, so he merely notes that they happened and moves on. This is the tale of his career, the journey of one man through planes and spacecraft and the agencies that build and manage them. When reaching the last pages of this book I was both eager to read what the last thoughts and conclusions from Collins were, and sad because I wanted more. When I finished reading Carrying the fire, I started questioning the saying "a picture is worth a thousand words". No picture of astronauts, rockets, Moon or Earth can describe the experience of being an astronaut and travelling to space as well as Michael Collins does in this book. Even though it doesnt depict in much detail the first landin When reaching the last pages of this book I was both eager to read what the last thoughts and conclusions from Collins were, and sad because I wanted more. When I finished reading Carrying the fire, I started questioning the saying "a picture is worth a thousand words". No picture of astronauts, rockets, Moon or Earth can describe the experience of being an astronaut and travelling to space as well as Michael Collins does in this book. Even though it doesn´t depict in much detail the first landing on the Moon - because as it happened he was orbiting it, often in the far side of the Moon with no communication- I never felt any dissapointment. The way he describes the whole process of being selected and training to become an astronaut made me feel so close to it that when the Apollo 11 mission comes into action I felt a lot of that excitement, and a little like I was going to the Moon too. I´m no expert in writing styles, but in my opinion Michael Collins does a good job in this book. He often uses humour and it´s a little irreverent at some points, but it´s something that I appreciate because he seems honest and doesn´t really brag. I was told by a reputable source that this one is the standard by which other first-hand accounts of space travel are judged, and I can see why. Compelling account of the heady cold war space race days. Michael Collins is one of the superdudes among amazing top test pilots. "The third man" of the first lunar landing, and Gemini veteran. We're talking about a living legend. An astronaut's journey is exactly that. A journey from almost the start of space exploration to the ultimate beginning of Moon exploration and on. What a story, and how well told, this has to be in the top 5 astrotales ever. The only reason I never gave it 5 stars was his p Compelling account of the heady cold war space race days. Michael Collins is one of the superdudes among amazing top test pilots. In retrospect I've had to change the rating to 5 stars. with the rest of the "free world". I didn't think I would like this book as much as I did. I read the dust jacket at Half Price Books and thought I'd give it a try. Like most people of my generation, I know little about the space program of the 60s. Collins' style (and especially his wonderful sense of humor) kept me hooked from the first page to the last. The fact that we even got into space, let alone traveled to the moon. landed on it, and walked around, is simply amazing after having read what was required to accomplish this I didn't think I would like this book as much as I did. I read the dust jacket at Half Price Books and thought I'd give it a try. Like most people of my generation, I know little about the space program of the 60s. Collins' style (and especially his wonderful sense of humor) kept me hooked from the first page to the last. The fact that we even got into space, let alone traveled to the moon. landed on it, and walked around, is simply amazing after having read what was required to accomplish this task. An account of an incredible journey by a very believable, very able, very modest writer. "There were no dull days in my time at NASA so there should be no dull pages in this book": and carries it off. Frightening in places even though the events themselves are well known. Completely unspoilt by the passage of time, either (the 1975 version, that is). I found this to be a well written account of Michael's life and enjoyed it immensely. From his career prior to and including his part in the initial moon landing, all covered in enough detail to keep it interesting and readable without getting overly technical. This is a great book. If your attention wanders during the first fifty pages, do not give up. Collins went to the moon, okay? He knows what's up. So stick with him. His account of the Gemini 10 flight is some of the most exciting writing I've ever read. Apollo 11 was also awesome, but lacked some of the sparkling wonder of Gemini. Again, a great book. Loved it. Really. Read it! This is such a fantastic book. Not only does Collins tell it like it is (or rather was), he writes beautifully and is such a personable narrator that I wished the thing could be twice as long as it is. Michael Collins is a former American astronaut and test pilot. Selected as part of the third group of fourteen astronauts in 1963, he flew in space twice. His first spaceflight was Gemini 10, in which he and command pilot John Young performed two rendezvous with Librarian Note: There is more than one author in the GoodReads database with this name. See this thread for more information.